David Ogilvy. Gene Schwartz. Gary Halbert. John Caples. Robert Collier. Claude Hopkins. If you work in marketing, or even just own a small business that needs customers or clients to bring in money, then these are names you NEED to know. Their combined careers have brought in BILLIONS of dollars in sales. And the systems and strategies that these guys used are still relevant and extremely profitable. So what’s the catch? Well, busy people like you don’t have time to study the lifelong careers of six of the world’s greatest admen. Luckily, the research has been done for you. The book itself is the result of hundreds of hours of research (time I know you don’t have). Plus, we’re giving you resources with rare, hard-to-find ads, writing samples, interviews, and presentations. Proven techniques that have made BILLIONS of dollars for over 50 years…and still do today! The best part? These are simple tips that you can implement TODAY to bring in new customers month after month. 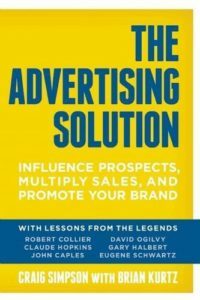 Hard to find ads and letters from marketing legends David Ogilvy, Gary Halbert, John Caples, Robert Collier, Claude Hopkins, and Gene Schwartz. You’ll have unlimited access to promotions that made hundreds of millions of dollars. Lost, classic presentations from three of the most sought after copywriters of all time, Gary Halbert, Gene Schwartz, and David Ogilvy. An updated and expanded version of the direct marketing classic, Scientific Advertising Illustrated and Annotated by Claude Hopkins. Don’t wait. This is valuable information that could change your career forever! Craig Simpson has managed thousands of direct marketing campaigns and has grossed hundreds of millions in revenue for his clients over the past 20 years. Simpson is the owner of Simpson Direct, Inc., an Oregon-based direct marketing firm, and a respected speaker/presenter on the topic of direct mail. Brian Kurtz has been a serial direct marketer for almost 35 years and is the driving force behind the Titans of Direct Response Conference. He writes and speaks regularly and consults with leading direct marketing companies and entrepreneurs in a wide variety of categories.